SIP Trunking is designed for business customers with deployed Internet Protocol (IP) PBXs and IP phones and provides essential telephony features such as local and long distance calling. SIP Trunking delivers voice calls in IP packets so it is easy to add Nextera’s internet, with products such as T-1 or DSL, for a complete managed service. Nextera provides even greater flexibility and opportunity by method of delivery – choose either traditional wired service or Nextera’s 4G WiMax. Each SIP trunk (voice channel) can be compressed to utilize as little as 35kbps to allow the maximum efficiency of your internet bandwidth. SIP Trunking has a standard set of features as well as optional a la carte services. SIP Trunking interfaces directly with your IP PBX to allow for voice over IP traffic for your calling needs. Compatible with industry leading platforms. 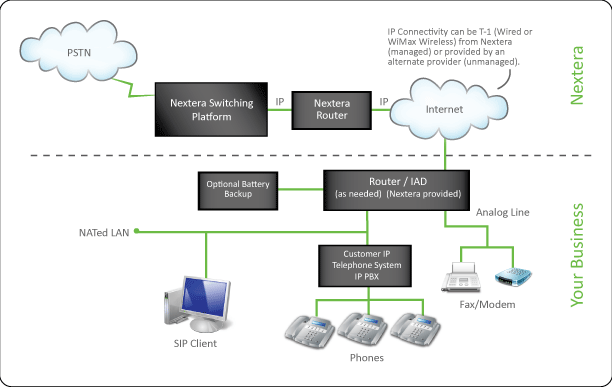 Nextera has interoperability with many IP-PBX vendor platforms to provide seamless interface. Unlimited local and EAS calling. Lower Operating Expenses: One vendor for all your voice and data needs. Combined with Nextera's broadband DSL or T-1, Nextera's voice optimized network provides reliable connectivity and security while providing consistent, clear call quality. Value: Capitalize on your equipment investment by receiving service that directly interfaces with your IP PBX. Expansion Ease: If you need additional SIP Trunks or increased bandwidth, Nextera is just a phone call away. Maximum Utilization: More than double voice capacity by utilizing codecs with compression. Hassle-Free: Single Provider for all your needs. SIP Trunking provides an IP connection between your IP PBX and the Nextera network that allows packetized voice traffic to be exchanged. When a call is placed from an internal phone to an outside number the IP PBX sends the call via SIP Trunks. Nextera’s softswitch establishes the connection. The call is established via the widely – accepted SIP (Session Initiated Protocol) standard for signaling protocol. Nextera offers service in over 9,500 rate centers nationwide. Quickly and easily determine if you are in one of those areas and can start taking advantage of Nextera’s voice solutions. 78.1% of individuals report living in a home with a high-speed Internet subscription. Minnesota is one of 26 states with rates above the national average, with 82.6% of the population living in a household with high-speed Internet use. Source: U.S. Census Bureau, published November 2014.